[Dark Grey] The Company of the Dragon headquarters: This spacious mansion has been home to the famed adventuring company for nearly 100 years. Prior to that it was owned by a mercenary company that formed the precursor to the City Watch. [White] The College of Abjuration: Situated in Castle Arcturus alongside the majority of the city's paladins, clerics and military recruits. Here students can practice their defensive magic with the allies they may have to help on some future battlefield. [Blue] The College of Conjuration: Outside the city walls this mostly elven college utilises the open space between its sprawling complex of buildings to summon objects and creatures in safety. As the college buildings intermingle with buildings on the roads into the city you will often find elven bards plying their trade and occasionally learning a trick or two from the college students. [Purple] The College of Divination: Slap bang in the middle of the Arcane Quadrangle (the location for all your magical component needs!) is the grand tower of the College of Divination. Being closer to the heavens means that they also play host to visiting astronomical scholars and the occasional druid. [Green] The College of Enchantment: In lavish buildings in the Noble District it is rumoured that the college's founder beguiled a former Queen into granting them the spacious and luxurious estate. The luxurious rooms and apartments are now home to students who study the arts of entrancing and charming others. [Red] The College of Evocation: Relocated to the riverside after one too many wayward fireballs this college is given a wide berth by nearby inhabitants. Nowadays they do at least manage to keep most of the scorch marks within the wrought iron and steel walls. The college is also the only safe site within the city to store and host the annual fireworks show in celebration of the start of spring. [Yellow, not on map] The College of Illusion: With the exception of students and faculty only a few senior officials within the government know the location and how to gain entrance to this college. Its location is hidden from the majority of the citizenry by powerful illusion magic. Rumour has it that tapping a certain brick on a wall in the Merchant District will reveal it to you but no-one has successfully managed this. [Black] The College of Necromancy: While its practice is not outlawed, necromancy is considered suspicious. It lends itself to a certain type of student who does not mind spending most of their days underground in the crypt beneath the Temple of Pelor. [Orange] The College of Transmutation: By far the gaudiest college these expansive buildings are adorned in rare metals that the wizards have transmuted from baser materials. On a sunny day the reflections into the Market Plaza are truly magical to behold. Clickthrough for the large version with labels. Since creating a whole world from scratch is a lot of work I will be using tools such as the Medieval Fantasy Map Generator and the City Generator to aid my imagination. The map above was generated using the Map Generator. This is a really cool online tool that allows you to procedurally generate city maps with a variety of options. It took me about 30-40 attempts to generate a map similar to what I had in mind as I really wanted the river to run through the city not next to it. This seems to be fairly rare with that generator. After exporting the SVG file I then modified it in Inkscape and used that to export the hi-def PNG. 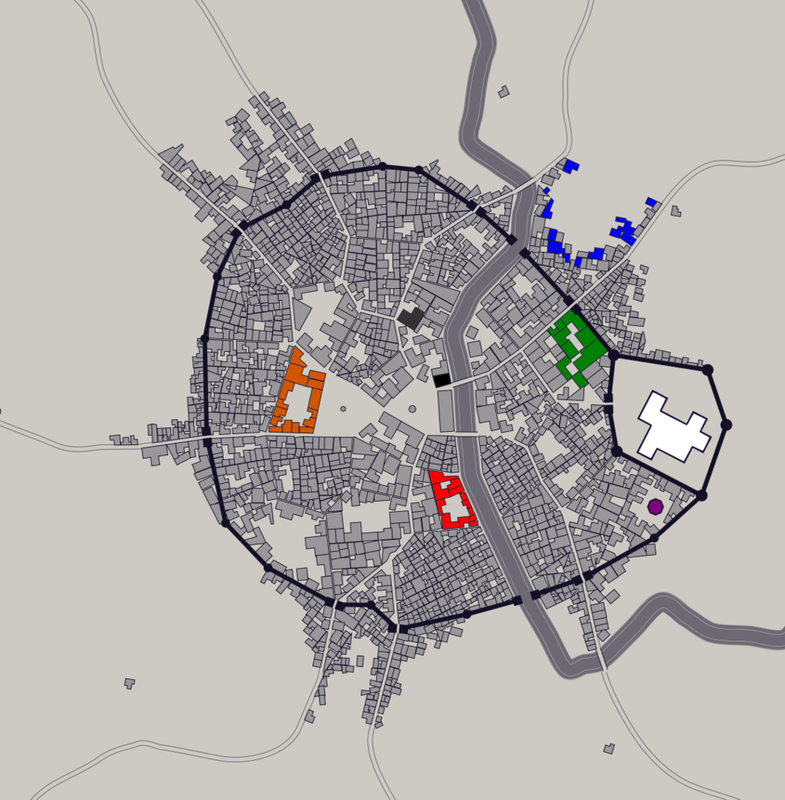 I used the City Generator and this article on demographics to pick the keys stats for Doran.